A beautiful trinity of flowers, plants, and humans. (三位一體)Nurturing professional florists and gardeners in the field of horticulture. Practical-oriented professionals who are highly regarded at work. People who lead the green culture. The Department of Horticultural Design fosters professional florists and gardeners with a promising vision, who beautifully decorate indoor and outdoor spaces with flowers and plants. Students will improve sensibilities required for designing by learning color contrasts, the emotions and images of colors, color schemes, and more through lessons on design elements and principles. Students will learn the basic theories and techniques of eastern and western flower arrangements. They cultivate basic skills required for commercial flower design and event flower design courses by making basic works and products at gardens or home. Students will foster basic knowledge of plant physiology (nutritional physiology, reproductive growth, and fructification) as well as application abilities for plant cultivation by studying the principles and theories of plant components and their metabolism. Students will learn about the classification, understanding, and characteristics of flower crops as well as the cultivation, management, usage, and management of flower crops that are widely used for gardening and landscaping in daily life. This course focuses on the environment where humans, plants, and animals live together from ecological perspectives and teaches the basic concepts of maintaining and managing such an environment. Based on the basic understanding of pathology, students will learn how to control various diseases occurring in ornamental plants, such as trees, herbaceous flowering plants, lawn, and horticultural plants. Students will learn plant terminology, plant names, plant characteristics, etc. to cultivate plant identification abilities, which are essential for plant management. Students will foster design skills by practicing advanced contents of western flower design and European flower design techniques. As a basic study of all horticulture courses, students will learn technologies for increasing the productivity of crop cultivation and the quantity of yields through lessons on soil formation and developmental properties, structure, physical and chemical changes, and fertilizers. Students will acquire information, such as production, sales, and price trends, as well as cultivate information processing ability required for the plant industry through lectures and hands-on lessons on the utilization of computer software like Powerpoint and Photoshop, and website-building skills. Students will learn about the types and characteristics of herbs, cultivation methods, types and usage of processed products, and processing methods for each type. Students will learn about the characteristics and specific management methods of major flower plants used in flower beds, parks, botanical gardens, golf courses, etc., and improve practical gardening ability. Based on the drawing method learned in the garden design, students will acquire the basic ability to design interior garden drawing plans using a computer. Students will cultivate the ability to create and manage garden flower beds by season using various plants, including annual plants, perennial plants, bulbous plants, and flowering trees and shrubs. Students will learn about the basics of the types and physiological characteristics of foliage plants, the management methods, such as raising seedling and fertilizing, as well as indoor garden design using foliage plants. 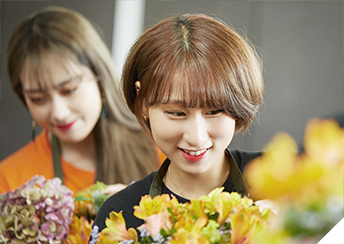 Students will master how to make flower products, such as bouquets, flower baskets, packaging, corsages, and bouquets that are mainly produced in flower gardens. Based on the theory of pestology, students will learn how to control various pests that occur in ornamental plants, such as trees, herbaceous flowering plants, lawn, and horticultural plants. Students will learn about the types, characteristics, establishment, and management techniques of lawn, which is a representative cover plant. Students will improve their ability to create indoor and outdoor gardens through lectures and hands-on lessons on how to use computer software CAD for garden design and how to write quotations. Students will learn how to craft products that are both highly artistic and decorative based on the practical skills acquired in the basic, business, and event flower design courses. Students will cultivate the ability to beautifully pack bouquets, flower baskets, flower pots, and foliage plants, which are mainly distributed through flower gardens. Based on an understanding of the characteristics of major foliage plants, students will cultivate the ability to construct interior gardens suitable for the indoor environments of apartment balconies or large buildings. Based on the techniques acquired in basic and business flower design courses, students will learn flower decoration skills for events, such as weddings, workplaces, funerals, Christmas, and opening ceremonies. This course provides an understanding of digital camera handling and photography techniques, specific characteristics of flower photography, and expression techniques in the Photoshop program. Students will understand the design principles using materials, study the design principles of three-dimensional modeling through hands-on exercises, and learn the trends of new flower designs that can be used for display and commercial use. Based on the basic theory of business administration, students will learn the laws, business start-up procedures, accounting, management strategies, and problems related to businesses of flower gardens or plant (landscape) management companies for improved job performance and management capabilities after employment. Students will learn the knowledge and skills related to the concept, roles, operation, and management of botanical gardens and develop the ability to plan and provide botanical education and interpretation for students and the general public in botanical gardens. Students will cultivate the comprehensive ability to manage plants by learning methods to diagnose the health condition of flower plants and landscape trees as well as medical treatment methods to solve problems in plants. Students will acquire practical skills to manage plants by learning techniques to cultivate, protect, and manage ornamental trees, which are one kind of the horticultural plants. Students will carry out individual and team projects where they plan and execute horticultural designs to cultivate practical horticultural design skills and abilities to create high-quality works and implement projects.